To make the avocado relish: In a medium bowl, add the tomatillo, scallions, cilantro, chopped pickled jalapeños, pickled jalapeño brine, lime juice, olive oil, and salt. Mix well. Incorporate the avocado and toss gently with a spoon to combine. Set aside. In a small bowl, combine the mayonnaise with the prepared horseradish. Set aside. On a cutting board, roll one slice of bacon around each sausage link. Place the tip of the hot dog over one end of the bacon slice, then roll the sausage around on the diagonal so that the bacon wraps around it and covers it entirely. Heat a large skillet or griddle over medium heat. Add the bacon-wrapped hot dogs and cook, turning every couple minutes, until crisped and browned on all sides. Remove from the heat. When cool enough to handle, cut a slit lengthwise down the middle of each, without cutting completely through. Raise heat to medium-high. Add two piles of about 1 cup shredded cheese onto the skillet and top each with a hotdog, slit-side down. Cook for 2 to 3 minutes until the cheese has completely melted and browned creating a cheese crust. Meanwhile, open the buns but try not to separate the tops from the bottoms. Lightly toast the buns in the toaster or griddle. Spread a generous tablespoon of the horseradish mayonnaise onto each bun. When bacon cheese hot links are ready, using a spatula, flip onto the bun, cheese side up. 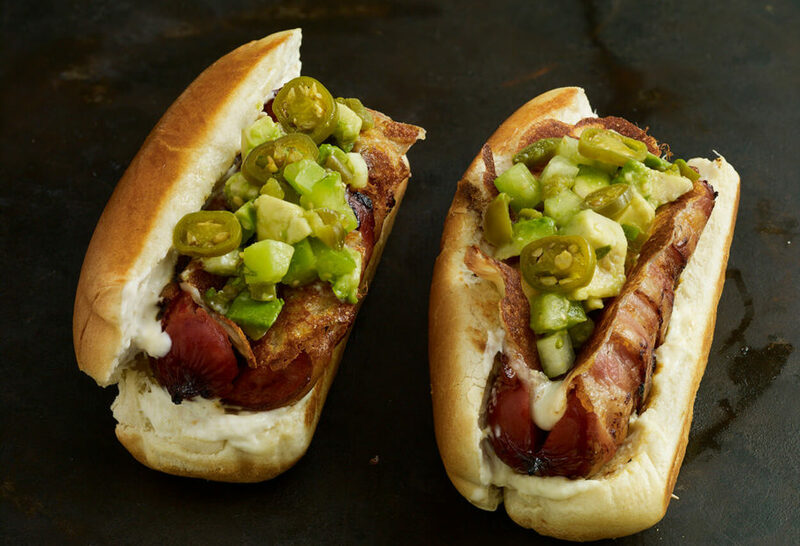 Top with a generous amount of the avocado relish, garnish with the pickled jalapeño slices and serve. Thank you Michael! I hope you and Sofia enjoy the hot dogs. When I saw this episode, I couldn’t wait to make these hot dogs. I’m not a lover of the hot dog, but these turned out wonderfully, and my family enjoyed them. I couldn’t find the FUD brand hot dogs, so I substituted with some Johnsonville Hot Links that I found. The salsa was amazing; i wanted to eat it all by itself! The tomatillo gives a great crunch and slightly sour taste and the avocado makes it creamy. We loved the spice of the pickled jalapenos as well. The cheese was messy to work with, but when it turned into a cheese crisp, it had a great added flavor. I’m so glad you enjoyed them Heather! This looks so yummy! My kids love to eat just plain cheese cooked this way.